Create standard email signatures, no form to fill out, responsible templates, team resources, and real email testing. Engage all employees in marketing, use to disclose promotions, events or a job vacancy, direct in email signature. Standardize, engage and increase the results with dozens of commercial email messages that are sent every day by your company. 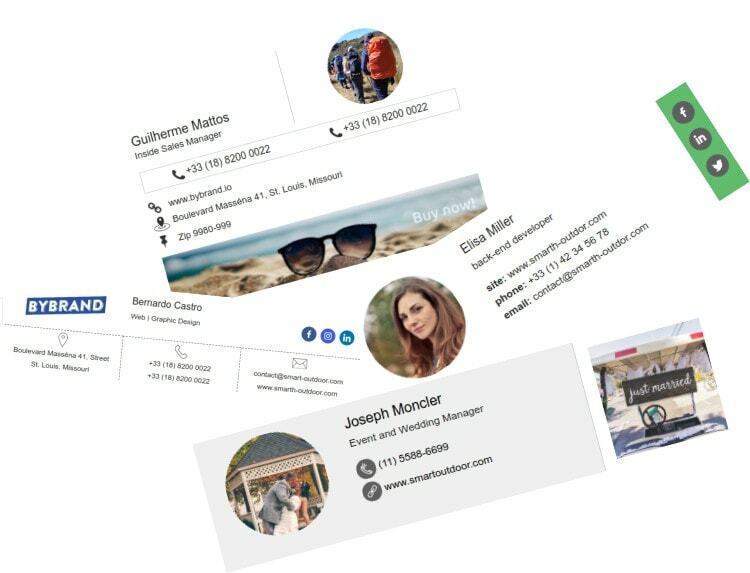 Create clickable email signatures, which redirect to your site or social pages, and make your company's phone rings more. Unlike image-only signatures, HTML signatures are visible even with image blocking by the email client. Reinforce your product and service offer by engaging all employees in your company marketing. Manage standardized signatures for everyone on your team and capture customers for your business with each email message sent. Connect Bybrand with products your team already uses. We will save you time in managing and updating employee email signatures. The need to serve a diversity of customers led us to the point where we saw the opportunity to create different levels of plans within Bybrand for the first time.